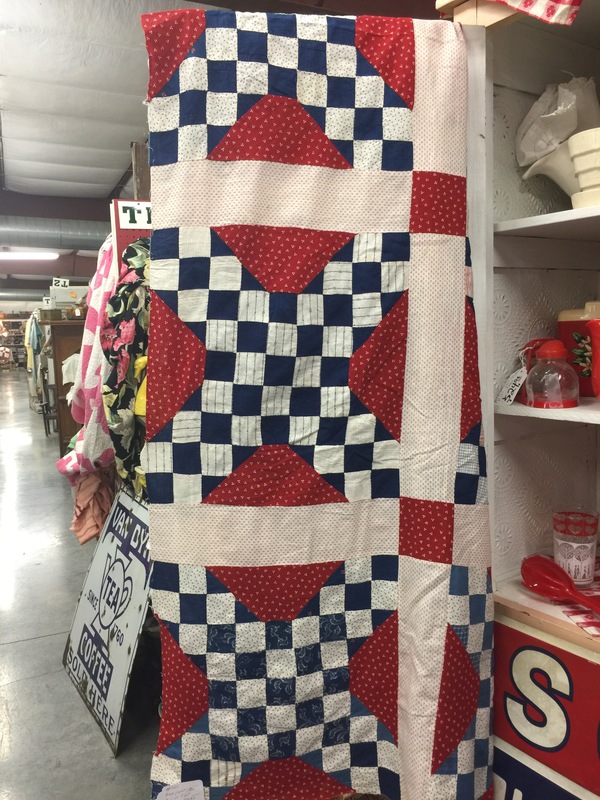 I saw so many interesting quilts while we were traveling, that I ended up splitting my pictures into 4 posts! 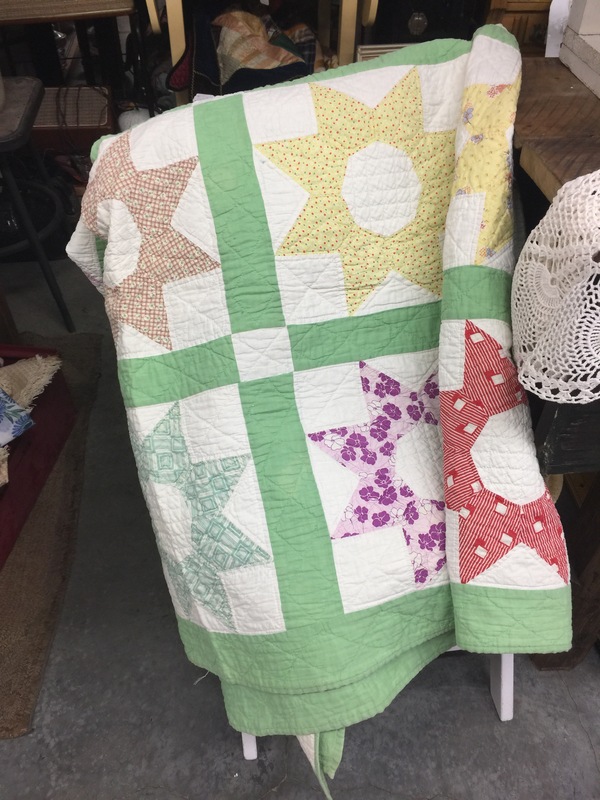 I love vintage quilts. I don’t feel a need to buy them all, bug I do enjoy taking pictures for future reference. I want to make one like this some day! I love, love, love that border! 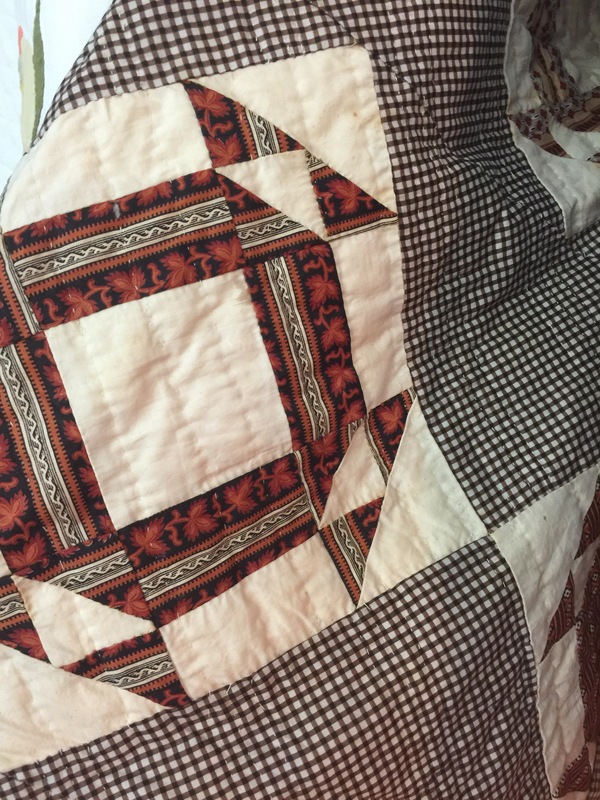 The next two puctures are the same quilt. Love the madder prints. This top came close to coming home with me! 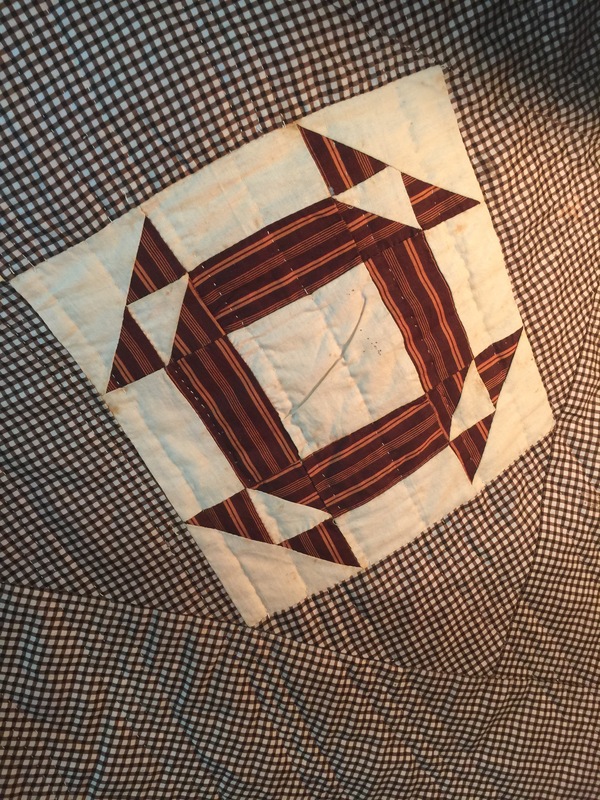 This entry was posted in Uncategorized, Vintage Quilts. Bookmark the permalink. 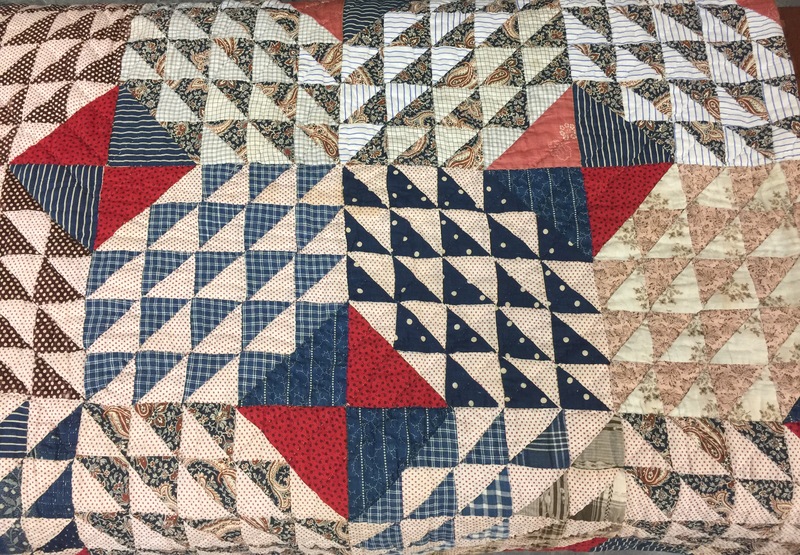 That second last quilt is so interesting! 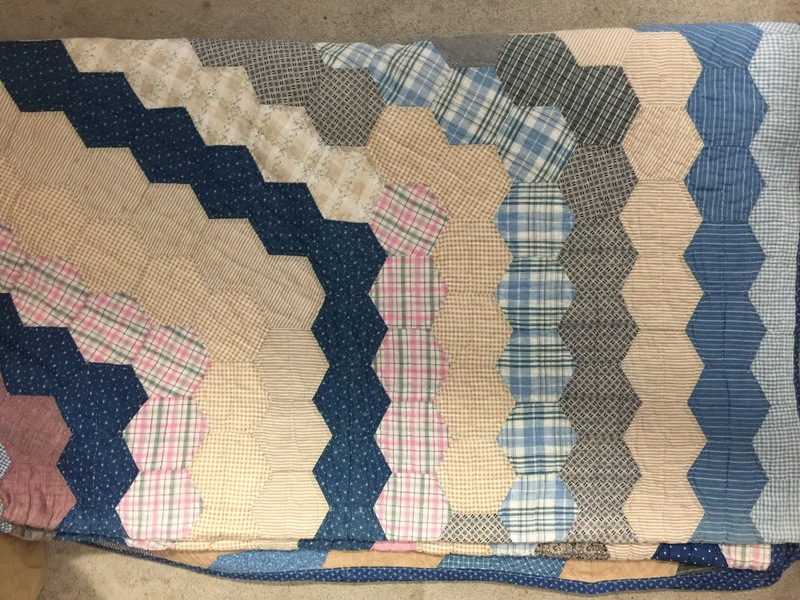 I had to study it to see how it was quilted. Thanks for this wonderful post! 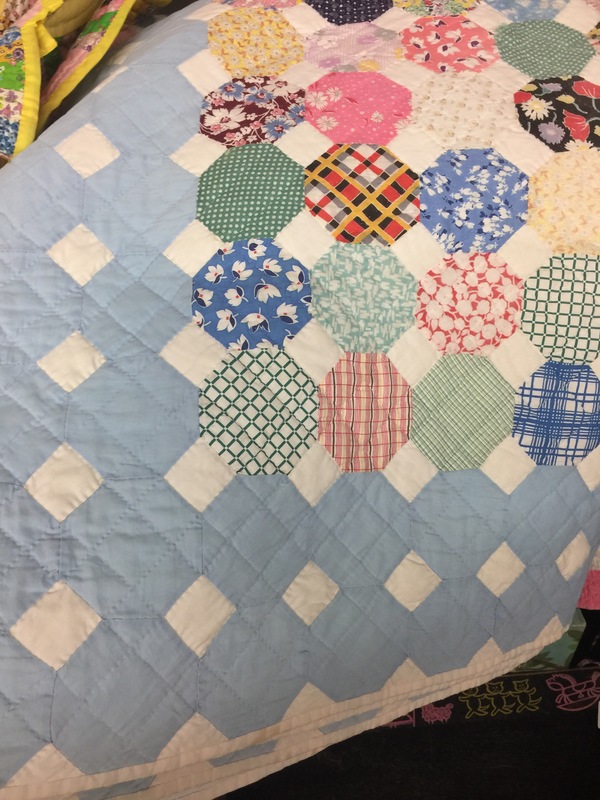 I agree that the snowballs quilt is a real inspiration. Thanks for sharing these vintage beauties. I love them! Thanks for all the great eye candy! So fun to see all these vintage designs! Oh, I love that border, too! 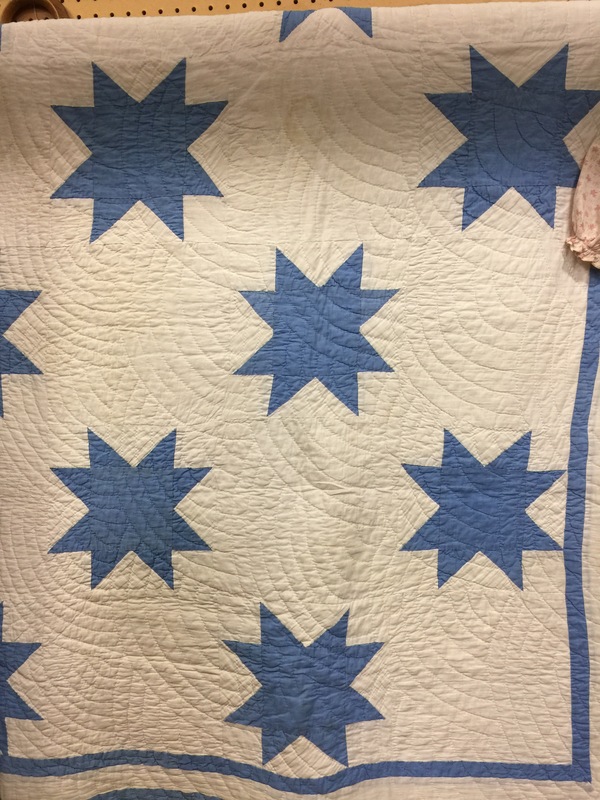 Love seeing old quilts, so inspiring. I bought one just like the last one -green bordered one – for $5 in Honolulu, HI. Mine is just a top. Hope to quilt it someday. Thanks for the vintage show. Yes, very inspiring! Love the navy and white one. Jenny at MO Star Quilt Co just had a tutorial (today or yesterday) on this block…called it the Dutchmans Puzzle, and such an easy way to make a flying geese looking block. I think my husband would love that. Have some white on white fabric with anchors, and lots of blues…hummm. Thanks Katy. Love your blog!! Some wonderful inspiration here. Thanks for posting them, Katy. 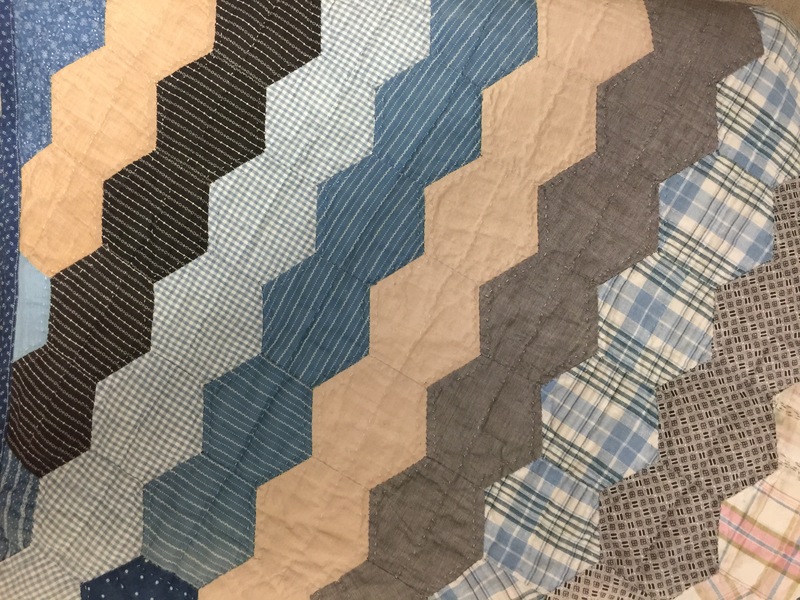 I love that first quilt especially and the second to the last one has a very unusual pattern and fabric. They are all beautiful quilts. 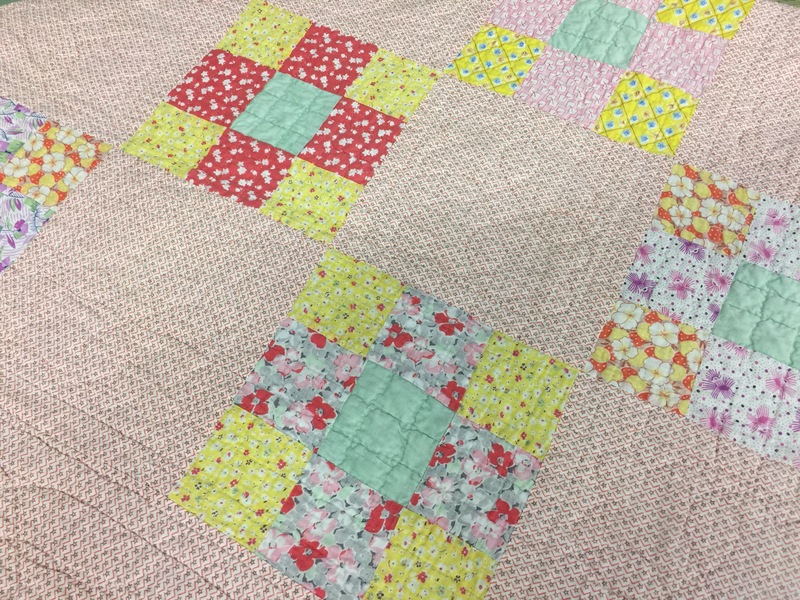 They are really pretty quilts! 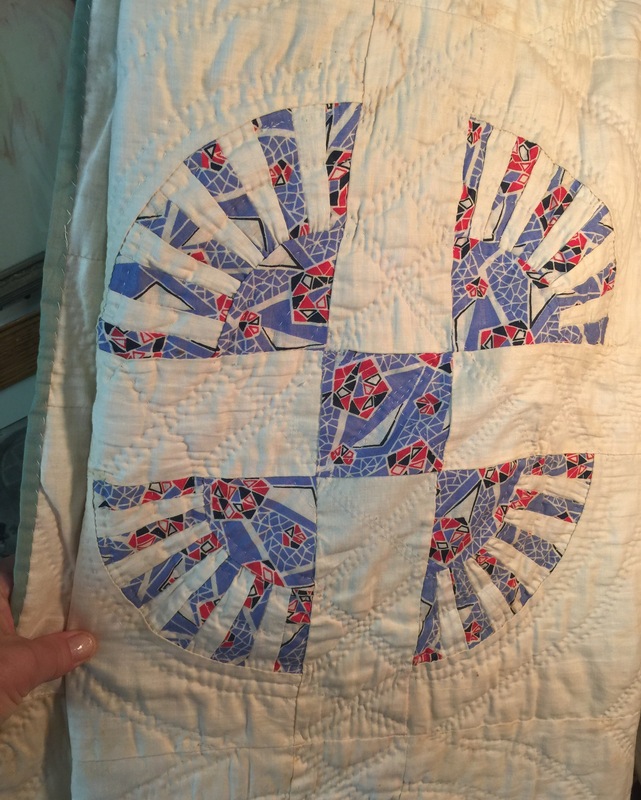 You passed up the quilt with the baptist fan quilting?? 🙂 I think I would’ve wanted to come home with all of them! I love vintage also. I guess it is because I’m vintage. 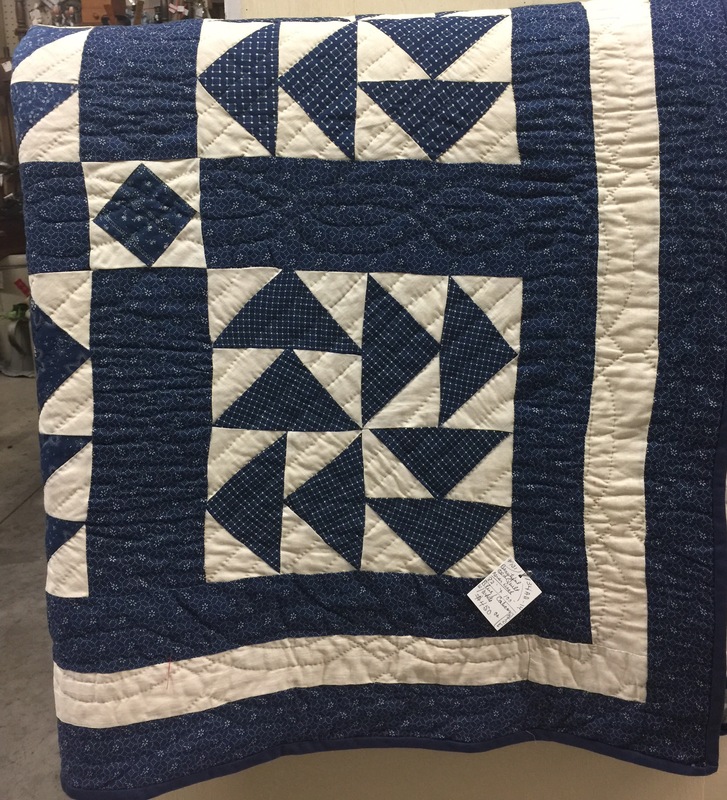 🙂 The blue and white border is pretty and looks perfect on the quilt. Could probably never find that exact shade of blue but if I ever do, it will be mine. I love them all too! I was at a festival and saw a vintage quilt someone was using as a picnic blanket on the ground and asked to take a picture. It gives so much inspiration! Thanks for sharing!